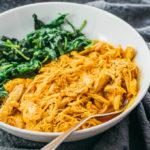 Tandoori chicken is an easy Indian recipe made in the Instant Pot pressure cooker. Low carb, keto, and gluten free. Add all ingredients to the pressure cooker pot except for the chicken thighs. Stir until well-mixed. Add chicken thighs to the pot, arranging them evenly on top of the yogurt-coconut mixture. Secure and seal the lid. Cook at high pressure for 20 minutes, followed by a quick pressure release. Uncover and transfer only the chicken to a plate. Use 2 forks to shred the chicken and then return it to the pot. Stir together. Turn on the saute mode to medium heat. Boil until it thickens from a soup-like to a sauce-like consistency, about 5 minutes, stirring frequently to prevent sticking along the bottom of the pot. Turn off the saute mode, and serve while hot. This recipe yields 6 g net carbs per serving (1/3rd of the recipe).